Earn $28.02 in Rewards credit (2802 points) What's This? 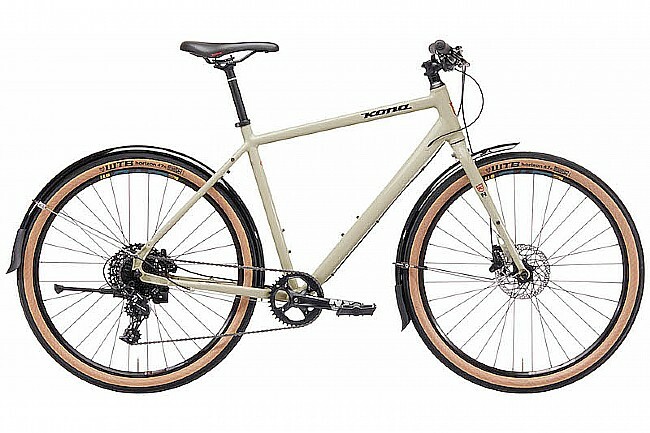 Kona's 2019 Dr Dew Bike runs 650b wheels, its weatherproofed by fenders, and powered by a SRAM NX 1x11 drivetrain. Frame: Kona 6061 Aluminum Butted. Fork: Kona Project Two Aluminum Disc. Crankset: SRAM NX, 38t X-Sync. Bottom Bracket: SRAM Powerspline 68mm. Brakeset: Shimano Hydraulic, RT30 160mm (centerlock). Seatpost: Kona Thumb w/Offset 27.2mm. Wheelset: WTB STP i19 27.5” TCS. Rims: WTB STP i19 27.5” TCS. Hubs: Shimano 100x9mm, 135x10mm (centerlock). Spokes: Stainless Black 15g fr / 14g rr. Tires: WTB Horizon Comp 650x47c. Manufacturer Warranty: 1-year limited on complete bike, lifetime limited on frame.